Glowing jewels ran down the corridor, the plasma strikes the distant approaching invaders. “Fire in the hole” shouts a marine. The screeching grenade arched through the air and decimates a horde of aliens approaching from behind. Major Sargent Martinez was providing intel to Admiral Frost over a ultra frequency transmitter. “Report received and understood. Stand-by” The transmitter crackles. The shooting stops and the area fell silent. “Area secure” reports a marine. Alex and Pauline moved through the halls of the experimental weapons labs, whispering to each other in an alien tongue, Pauline affectionately strokes the coarse skin of passing demons. They came to a locked laboratory and Alex looks into the retina scanner. “Authorization Accepted. Welcome, Chief Administrator” says the computer voice. The door whooshed open, expelling a gasp of sterile smelling air. The pair walk inside. In the centre of the lab was a large, square work table littered with various parts. Locked cabinets along the walls held prototype weapons and shelves of data sheets, two holo-terminals flanked each other from the middle of the room and a left-hand passage led to a small workshop. Looming before them was another door, they approach it and walk inside. A large weapon was stored within. The artificial light glitters against the grey, polished surface. It had a pair of shoulder mounts on the back and a large, wide barrel on the front. Alex unlocks the armament from its mounting. 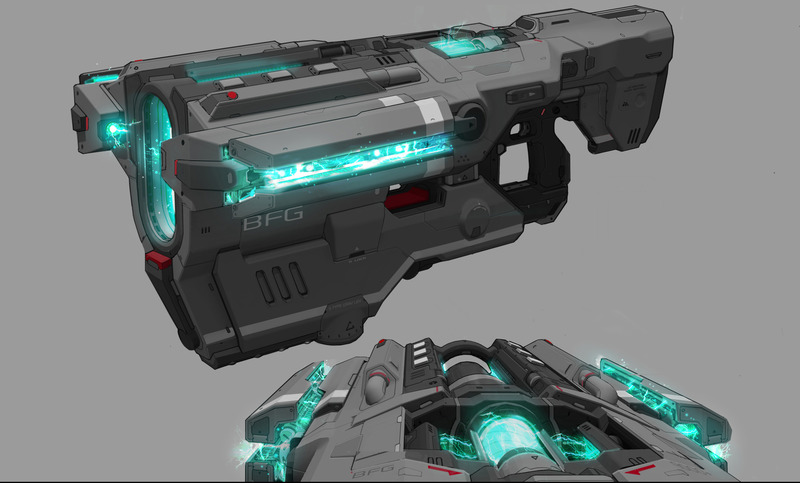 He picks it up and inserts an energy cell pack, the BFG 9000 hums to life. Outside the base, in the twilight of space, a corporate vessel cuts its blazing thrusters and descends upon another of the Deimos escape pods. The ship slows to a stop and a clawed robotic arm extends from a hatch, it grips the pod and draws it into the spacious hanger bay. It was placed among other escape pods, resting on one of several flat plasma fields uniformly layered in the hangar. The Deimos researchers walk from the pod and a holographic attendant led them to the elevator. They walked through the large doors, leading to the rest of the ship’s interior. Another hologram greets them. “Welcome aboard the CSV Navigator” it says “Accommodations are being prepared for you at this time. In the meantime, the Executive’s Common Area will have everything you may need” it explains. “Councillor Crawford has scheduled a meeting with Dr. Nexson and Director Banks. Please make your way to Conference Room 7-B at 1830 hours” it finishes. The two men exchange stern glances. The researchers move into the adjoining hallway, walking swiftly among heavy pedestrian traffic. “Rupert, we need to find a sub-space terminal” says Will. Banks and Nexson enter a nearby Sub-Space Parlour and step into a booth, pulling the privacy screen closed behind them. Banks entered a six digit code into the touchpad and placed the call. They stood waiting as the signal was relayed over a sub-orbital receiver. “Video uplink established” chimed the terminal. The video call opened, a finely dressed man with dark eyes and a stone-cold expression filled the holo-monitor. “Hello Doctor, Director” the man says, “I’m glad to see you made it off-station. I can hardly believe these reports, this is going to become immensely costly” he states. The Fusion Power Plant was throbbing with activity. The walls held flat white panels, small repair robots moved along the floor, occasionally popping into and out of small doors leading to a delivery chute that led to all areas of the plant. “Condition: Alert” the female computer voice repeated softly. A surplus of technicians and engineers stood around supervisors as they received their rapidly spoken emergency instructions and assignments. Space Marines were spread throughout the facility. The Power-Plant was under an extreme alert condition because their reactor specialists were performing a delicate experiment when the invasion occurred. Chief Engineer Rivera and Engineer Clark were in the Reactor Control Room, studying the anomalous energy readings on the holo-monitor, behind the view screen was the MCR-700 Reactor. They were sitting in high-backed chairs. “Gamma radiation in the core is rising” the engineer utters, pointing to a climbing digital gage on the monitor. “Let’s try Alpha-6 emission configuration on Module-B” Clark suggests. The Engineer calmly enters the command into the terminal. “That doesn’t seem to be having any effect, reduce the master density controller by 9 degrees” Rivera instructs. Troublingly, the Gamma radiation and temperature continued to climb. “It seems like something is interfering with the operation” Clark suggests. “At this point, it wouldn’t surprise me. We need to evacuate the station with everyone else, we’re going to have to program the maintenance robots to monitor the reactor and regularly vent the radiation, or this station will have an alien invasion and a flood of toxic radiation to contend with” says Rivera. They issued new commands to the maintenance robots and left the control room. They walked a nearby humming corridor, electrical conduits and coolant pipes stretched along the walls. “If we lose that reactor, they can forget about saving this station anytime soon” comments Rivera. “We’ve never had issues like these with the MCR-700 before, whatever is causing those spikes, it’s a mystery to me” replies Clark. “It shouldn’t be a big problem. As long as the maintenance robots–” Rivera is startled by the sudden opening of an intersecting door. The hydraulic sigh sounded as the door raised, revealing the Chief Administrator and his assistant. The Chief Administrator stared back with dark, unforgiving eyes, his BFG 9000 was loudly charging in his hands. The two men looked down at the glowing green barrel and gasped in horror, they dodged to evade the round. Clark was caught by the destructive blow and suffered instant demolecularization, the bio energy continued into the wall of the corridor, severing several critical conduits and making a large crater in the wall. The Chief Engineer hit the ground, clothing burned by the BFG’s blast, he stared dumbstruck at the brutal murder of his colleague. “Alarm: power failure detected. Emergency power is now online” echoes the station computer as red emergency lights flooded the corridor. 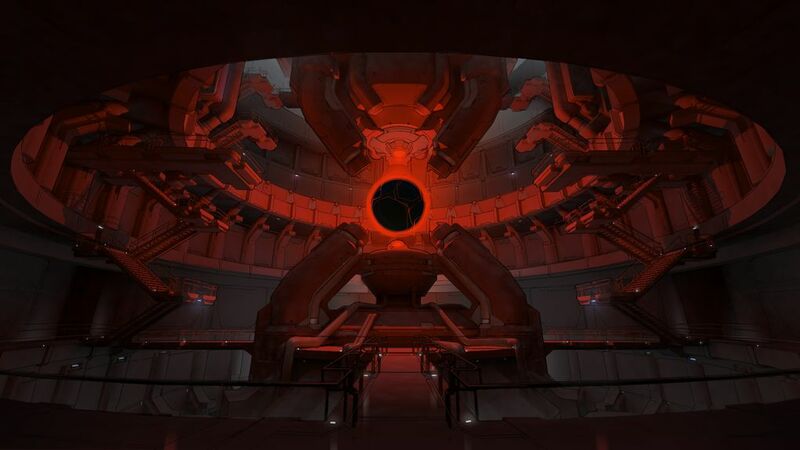 The pair of Former Humans stepped from the passage and looked down at their prey, the engineer looks into the pure black eyes and fear jolted him to his feet. He made a stumbling attempt to escape in the other direction, panting loudly. From behind he heard the build-up of the BFG 9000. He was soon overtaken by green energy and fell to the ground in a pile of blackened ash. Doctor Who – Face the Raven (S9E10) – The Death of Clara! !